Termites are what we call “silent destroyers.” They can slowly and unknowingly be growing in number in your home, and may be eating their way through crevices and even in sturdy-looking structures, without discernible signs of damage. You may notice their presence only when the structure falls. Experts approximate that homeowners spend billions of dollars annually to treat infestations as well as repair termite damage. Needless to say, early detection is vital to limit the scope of a colony’s destructiveness. However, this can be difficult to do. All termites feed on cellulose-based plant materials. Unfortunately, most homes, regardless of their construction type, can provide cellulose food for termite penetration. Homeowners rarely see termites, as they hide in concealed nests and devour wood from inside walls. Still, there are ways to detect their existence. A termite’s mouth can tear pieces of woody materials. While termite workers only measure more or less 1 cm to a few mm in length, their feeding habits are capable of causing costly damage to property. House foundations, furniture, shelves and even books are probable feeding sites for termites. Underground termite homes usually develop on the ground. Within each mound, termites build complex tunnel systems and mud tunnels through which they enter above-ground food sources. Dry-wood termites, on the other hand, thrive within the wood that they consume. They normally infest walls and furniture. When a termite colony has developed, winged, swarming termites can be seen around windows as well as doors. Winged termites are greatly attracted to tracks of light and are in action in spring. After mating, these termites find a new breeding site to create another colony, thus spreading infestations throughout a number of locations, particularly in the case of dry-wood termites. As a home or business owner, you should then be mindful of the risk that termite infestation can do to your property, especially as termite damage is not covered by most home insurance policies. Aside from seeing termite swarmers during spring, another evident sign of their presence is the damage they cause on your property. To tell if you have termites in your home, is to look for the early damage signs they normally cause. Floor damage. Termites can mar laminate flooring as well as skirting boards. Affected flooring may break out or wilt in some areas. Checking underneath the flooring may help to reveal termite activity. You can also check if your floor feels more sodden and maybe wells up more than usual. Wall damage. If you see unexplained cracks on your house’ internal walls, there is a good sign that termites have eaten their way through them. As termites feed on cellulose that are found in timber within walls, the noticeable cracks could be a sign of termite activity within these walls. Ceiling damage. Wooden ceilings, beams, architraves as well as rafters in your attic are just as much at risk of termite damage as wooden structures that are found closer to the ground. Look for noticeable cracks on your ceilings and cornices. Foundation damage. The kind of foundation that your property is constructed, has a great effect on how easy it could be for termites to gain access into it in search of food. Even though a lot of foundations at present are made of concrete (termites do not eat concrete) they are capable of squeezing their way the cracks within these concrete blocks. From there they gain access to floor joists, which are made of wood. If you are building an extension, setting a chemical termite barrier underneath the concrete may prevent termites from sneaking through foundation cracks. Homes built with crawl spaces are at greater risk of damage as their foundations are still made of wood. Sticking windows and or doors. Windows and doors that have been infested with termites will become difficult to open, as these termites may make the frames deformed. Garden damage. Decking and wooden fence posts in your garden are also at great risk of termite infestation. Long-term damage could later cause the structures to collapse. Termite-treated wood or metal posts, can prevent this problem. Termites can also cause damage to trees, leading to its branches to fall off. Damaged roof tiles. Gained moisture in your home due to loose, broken, or even damp roof tiles can also attract termites. Broken roof tiles are immense source of moisture, which will later draw termites and give them access inside your home. Once they are inside your house, these termites are able to move through a property quite with no trouble and infect to eat away all the wood components within the structure. Considering this, you should make it a habit to replace any damaged or water-logged roof tiles to ensure that you won’t make your roof a haven for termites. Weak and or hollow-sounding wood. Termites usually feed on wood beneath the surface, which makes them undetectable. As they eat through the wood, without you noticing them, they create hollow colonnades below the surface. These passage ways make the actual structure sound hollow, if and when you knock or tap it. Wooden doors, furniture as well as any wooden structural support within your property are all at risk. Thus, you need to make sure that they would be checked for termite infestation if you see these signs. Frass. This is another word for termite droppings. Although they will cause no damage, droppings are obvious indicators of the presence of termites as well as the potential damage that these pests can do to your property, as frass is the derivative of their consumption. Mud tubes on exterior walls. These function as shelter for termites and are normally located near the foundations of your home. Sub-terranean termite species usually build mud tubes, which also provides them moisture. They are made up of soil and also termite droppings. Avoid attracting termites by removing all moisture rich environments, as well as storing firewood, mulch and wood chips away from your home. Look for mud tubes on visible areas of your walls, including your basement walls. They can easily be seen even with the naked eyes. Termites can create a serious problem not only to your biggest investment, but to you and your family as well. If you suspect termite infestation, call a licensed pest management company to do an inspection right away. 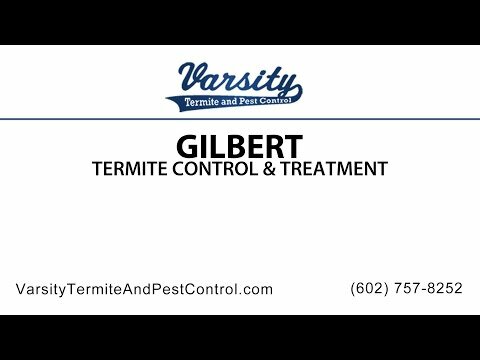 A Gilbert termite specialist can recommend a custom-made treatment as well as prevention plan that will involve liquid repellents, baits, wood treatments and, if required, fumigation of the whole structure. It may take a while before you may actually notice any infestation. Once perceive it, a quick call to a termite specialist will be the best thing you can do. Call us today!